October was a whirlwind month for me! As most of you know, on October 14 in Charlotte, NC, I was installed as GCI’s new President (click here for a report in GCI Update). It is a privilege to be entrusted with this responsibility and I look forward to what lies ahead as, together, we enter a new chapter in GCI’s story. The week following the handoff of the presidency to me from outgoing President Joseph Tkach, was followed by a busy week of planning and strategy meetings held with GCI denominational leaders from around the world. During those meetings, I introduced a new organizational structure for our denomination—I’ll share details in GCI Update reports in January. During the meetings in Charlotte, we honored various denominational leaders who recently have retired or soon will retire from GCI employment, including outgoing President Joseph Tkach. 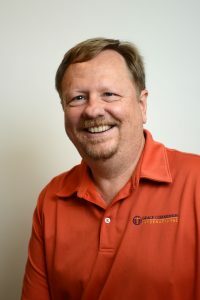 Another of those leaders is Ted Johnston, who (among other responsibilities) has served as GCI Equipper publisher and editor. 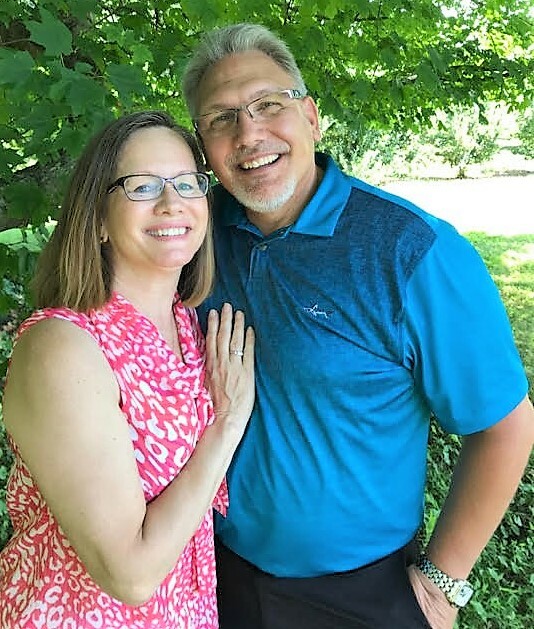 As this year finishes out, Ted’s Equipper responsibilities are being passed to GCI-USA Regional Pastor Rick Shallenberger (more about Rick below). I want to thank Ted for the work he has done. He launched Equipper 12 years ago then, over the years, added various features—most recently sermon manuscripts synced to the Revised Common Lectionary. Beginning with this issue, he has added to each sermon a Speaking of Life video and discussion questions. Both are synced with the RCL scripture readings and thus with the sermon. As you will see in the December sermons, our Speaking of Life video program has been revamped. In addition to being synced with the RCL, it now has multiple presenters who represent the diversity we are blessed with in GCI. I will be the primary presenter and other presenters will include elder-administrator Michelle Fleming, and pastors-administrators Jeff Broadnax, Anthony Mullins and Heber Ticas. The discussion questions provided with each sermon are for use by small groups in unpacking what is covered in the scripture readings, Speaking of Life program and sermon. Having these discussions helps reinforce learning while building relationships among group members. It’s our prayer that these expanded RCL-synced resources will assist our pastors, preachers and teachers in their ministries of the word of God within their congregations. As mentioned above, Rick Shallenberger will become the new editor and publisher of Equipper as 2018 draws to a close. I first met Rick in 1981 on a camping trip in California. At the time, we were both Ambassador College (Pasadena, CA) students. Though I did not know Rick well (I was a sophomore, he was a senior), a life-long friendship between us began on that trip. Rick graduated later that year and started full-time work with the denomination, eventually working in our editorial department. 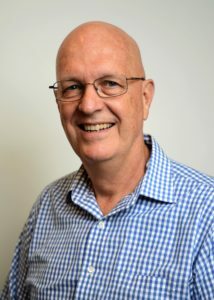 Over the years, Rick held many different positions in that department, most notably as lead writer and finally editor for Youth magazine. 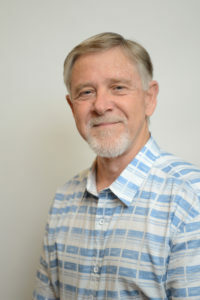 Rick worked alongside accomplished writers and editors like Herman Hoeh and Dexter Faulkner, who served as his mentors, preparing him well for the role he is now assuming from Ted Johnston. Rick eventually entered pastoral ministry, as did I. We occasionally saw one another, but it was not until 2013 that we began working closely together. Along with Ted and Randy Bloom, we helped reorganize GCI’s U.S. administrative structure. This led to Rick becoming a GCI-USA Regional Pastor, along with spending significant time contributing to GCI publications as a writer and editor (most GCI denominational leaders wear multiple hats!). I recently asked Rick to add more hats by becoming Assistant to the President and Editor and Publisher of Equipper. Rick taking on these responsibilities will enable me to cease writing lead articles for Equipper in order to focus my attention on writing lead articles for GCI Update (I will continue contributing to Equipper as time allows). As a US Regional Pastor, Rick is “in the trenches” with our pastors on a regular basis. He also has strong relationships with many of our international leaders. His new responsibilities are thus a natural fit and I’m confident that Equipper will continue to serve as an effective tool for equipping our pastors and ministry leaders for their participation with Jesus in his ongoing ministry to the world through the church. Let’s all thank Ted for his years of service, and pray for Rick as he takes on his new responsibilities. This article from GCI-USA Regional Pastor Randy Bloom continues our series on Worldview Conversion and Whole-Life Discipleship. In the Western world today, Christian faith is largely marginalized. We’ve entered a post-Christian era in which traditional approaches to evangelism (a key part of whole-life discipleship) are largely ineffective. That being the case, we are challenged to answer an important question: How can we, as followers of Jesus, participate with what the Holy Spirit is doing to evangelize people who lack any semblance of a Christian worldview? Much has been written in answer to this question, but rather than reviewing the literature, I want to share some of what I’ve learned through friendships with non-Christians. While I don’t claim to have all the answers (who does?) or to have the keenest discernment on this challenging topic, there are a number of things I’ve learned that may help us as we seek to discern and then participate in what the Spirit is doing. Let’s start with a simple definition: Evangelism involves sharing the gospel with people and helping them respond by becoming followers of Jesus. We probably all agree that evangelism is a process—the ongoing ministry of the Spirit as he works in the lives of people over time, relentlessly drawing them to Jesus. We are called to participate in what he is doing, but how? How do we evangelize people who have little interest in the things of God—people who are not yet asking searching questions about God? We already have relationships with some of these people, while others are merely passing acquaintances. How can we participate in what the Spirit is doing to evangelize them? Let’s face an uncomfortable reality—as Christians, most of us are out of touch with the worldviews (beliefs, values, ideals) held by the non-Christians around us. Perhaps we’ve read some things (book knowledge), or heard some things (often biased and limited information) or gained some (limited) knowledge from our direct experience. But because we’re deeply entrenched in church life, most of us are far removed from the non-Christian world around us. While this is natural, it limits our ability to participate in Jesus’ mission to a largely post-Christian world. The first step in evangelism is to connect with non-Christians. But doing so is a challenge for most Christians because the worldviews held by non-Christians seem strange to them. Therefore, engaging a non-Christian takes a willingness to be uncomfortable, and it also takes work—perhaps that’s why most Christians shy away from evangelism. As Christians, we often judge (condemn) or merely dismiss those aspects of non-Christian worldviews that we don’t understand or like. If that assessment seems harsh, remember it’s how Christians are perceived by most non-Christians. So what do we do? A good place to begin is to cease separating ourselves from the non-Christian world. This separation likely came about unintentionally as we engaged in church activities that were largely inwardly focused. The more we engaged in such activities, the more we detached from unchurched people. This led to us becoming uncomfortable in their presence, finding it difficult to relate to and engage with them. The way we reverse this unfortunate situation is by first humbly admitting that the separation exists, then stepping out of our comfort zone (sequestered behind church walls). If we don’t take these steps, it’s highly unlikely that we’ll be able to share our hope and faith with any non-Christians. Engaging non-Christians (even those who are anti-Christian) at a personal level requires lots of patience and rather thick skin. “Going deeper” relationally with people who do not think like us, and who disagree with us on many issues, is not for spiritual “wimps.” Keep in mind that the “judgment radar” of most non-Christians is sensitively tuned. We Christians too easily fall into judgmental patterns that shut down communication with non-Christians. They hear judgment from us even when it isn’t there—it’s in our looks and tone of voice. We sometimes can’t help ourselves. For instance, how do we react to and converse with devout Buddhists, Muslims or atheists? How do we react when someone uses foul language, makes crude remarks, or acts in other ways that contradict our Christian beliefs and values? How do we react when someone expresses support for abortion, for LGBTQ lifestyles, or for political viewpoints different from our own? We don’t have to take a compromising stand on these issues, but sometimes the way we react when presented with these worldview issues make us appear uninformed, disconnected from reality and judgmental. As humans, our sense of personal identity is deeply bound up with our worldview—our core values, deeply held beliefs and key understandings. Because most of us have spent a good deal of time and effort thinking about such things, we tend to view criticism of our worldview as an attack on our personhood. This is true for Christians and it’s also true for non-Christians. Thus when worldviews clash, our interactions can become quite volatile. My point here is that in order to engage people who hold non-Christian worldviews, we Christians must exercise a great deal of understanding, tact and humility. We need to love our non-Christian neighbor as ourselves! In discussions with non-Christians, referring to the Bible or to Jesus gets a bit tricky. We may assume that they are acquainted with biblical concepts or terms and have at least a basic biblical understanding with which we can address their questions or issues. But we are mistaken in that assumption. We live in a world that is now largely post-Christian—a world where most non-Christians are not only unacquainted with what Christians believe, but are apathetic or even antagonistic toward Christians. They have little interest in What Would Jesus Do? (WWJD) or other Christian platitudes. They are not interested in hearing what the Bible says. Without becoming defensive or frustrated, we have to back off and identify a basic starting point with them—asking good questions, then listening carefully. 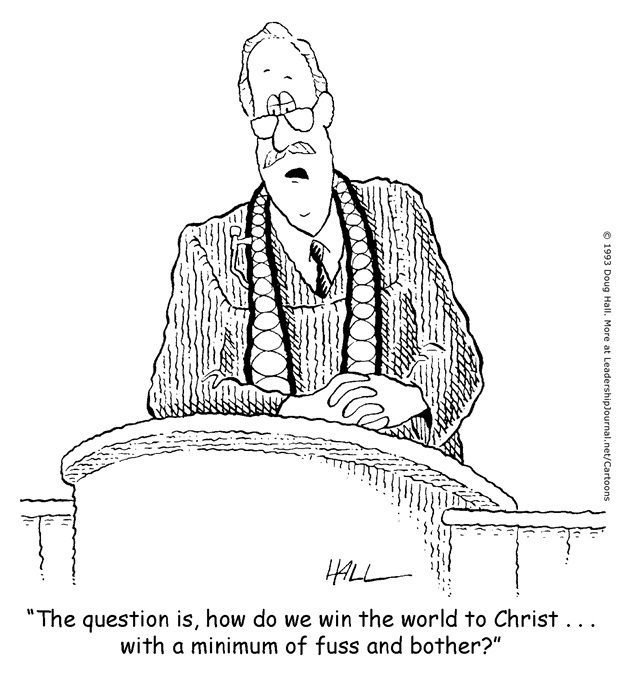 Many of us don’t have a good working knowledge of the many worldviews held by non-Christians. This lack of understanding underscores the need we have to ask good questions and then listen carefully to their answers in order to gain understanding concerning what they actually believe. Our preconceptions concerning their beliefs may be mistaken. So rather than jumping to unwarranted conclusions, we need to patiently and graciously seek clarity. Doing so often takes a great deal of time. It can be difficult to listen to ideas that are not only radically different from our own, but often are illogical and fanciful. But it’s vital to take time to understand what they actually believe (some research on the side may be necessary—see the references listed at the end of this article). With that knowledge we can then identify points of connection between their worldview and ours—points of agreement that can serve as a bridge of connection, opening opportunities for us to influence their worldview in the direction of Christ. As we listen deeply, we may be amazed at what we learn, and how our own views on some things may change along the way. In seeking to understand the worldview of a non-Christian acquaintance, its sometimes best to ask or say nothing, taking time to develop relational credibility before bringing Jesus or the Bible into the conversation. In doing so, we need not think we’re failing to stand up for Jesus—he stands for himself just fine! We also don’t need to feel that by not speaking up we are missing an opportunity to “witness.” In our post-Christian world, a silent, nonjudgmental witness is often more effective than words. Silence is often a more powerful way to declare “the right thing.” Simply loving people—being available to them when opportunities arise—is often the best way to help non-Christians come to know Jesus. Silence may be a spiritual gift we need more of as we trust the Spirit to do his often mysterious work of evangelism. As we connect relationally with non-Christians, we’ll encounter some who, further along in their journey with Jesus, by the Spirit, are asking questions, wanting to know about God, the Christian faith and the Bible. It may be that the Spirit has led such people to us to help them unravel the tangled web of their current worldview, and are open to the simplicity, hope and joy of knowing Jesus. How can we be of help at that point? What can we do to evangelize them? Again, we start by seeking to understand what they are currently thinking and believing. Then we look for points of commonality between those beliefs and the Christian faith. We then proceed, gently helping them see the points of illogic or futility in their current beliefs, and sharing with them the simple truths of the Christian faith: who God is, his love for them, and how they don’t have to jump through hoops to be accepted by him. This is the time to share with them a simple presentation of the gospel. It’s not a time for making profound, complex theological statements. Remember, we are relating to people who are early in their Christian journey. They will not likely relate to language and concepts that are second-nature to us. Our challenge is to meet them where they are—to understand their questions and needs and then speak accordingly, using terms and thought-forms they understand. I’ve been told on several occasions by non-Christians that Christian answers to difficult questions typically sound simplistic. Let’s avoid that by answering their questions in ways that share the gospel without coming across as offering simplistic solutions to complex problems. As people respond positively, we can then help them take additional steps. We can continue meeting with them one-on-one, then invite them to a gathering of church friends, a small group meeting, or a church service. The goal is to continue journeying with them. Every step along the way in this journey, we can trust that the Holy Spirit is at work. At some points it may seem there is little or even no progress, but keep in mind that the Spirit’s work is often unseen, even mysterious. Realize that the Spirit is the primary agent in the communication of the gospel and that he is at work in the lives of all people. We can trust him to reach people, drawing them to Jesus in his way and in his time—even those people who appear to be most resistant to his ministry. Our participation in the Holy Spirit’s ministry to evangelize people around us may extend over a very long time—even our entire lives. We need to be willing to be participants with the Spirit in his work of evangelism over the long haul. We will enjoy the process more if we trust the Spirit to work in people’s lives. There is much more that could be said about evangelism in a post-Christian world. Hopefully this article advances the discussion. Overall, the place to start with evangelizing people who hold non-Christian or even anti-Christian worldviews is to love and respect them, even when they seem rather unlovable and resistant to the truth and logic of the gospel. I pray that we will be willing to connect with them in almost any circumstance, and to get to know them as people who are loved, forgiven and accepted by God, regardless of what they think or believe at this time. Participating with the Spirit in evangelizing people means living incarnationally—living with them as Jesus does, by the Spirit: where they are, as they are. It means doing the hard work of laying aside our judgments, presuppositions and expectations, while seeking understanding, and while loving people unconditionally at all points of their journey. We can grow in our ability to do this as we live our life in union and communion with Christ. After all, the same Jesus who lived personally and intimately in our alienated, sin-filled world now lives in us by his evangelizing Spirit. Let us live by the Spirit, following him in evangelizing non-Christians. 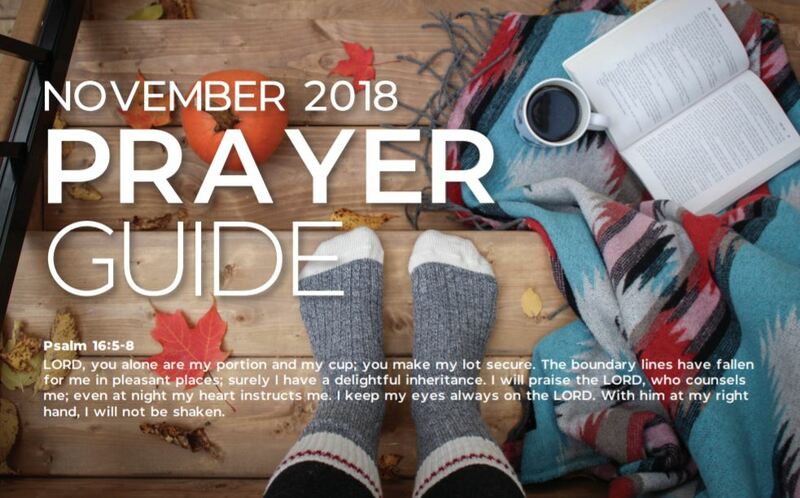 Click on the image below to download a listing of GCI-related topics to pray about each day during the month of November. As we continue exploring key elements of Healthy Church, we come to the receiving of offerings—a key part of the hope venue. 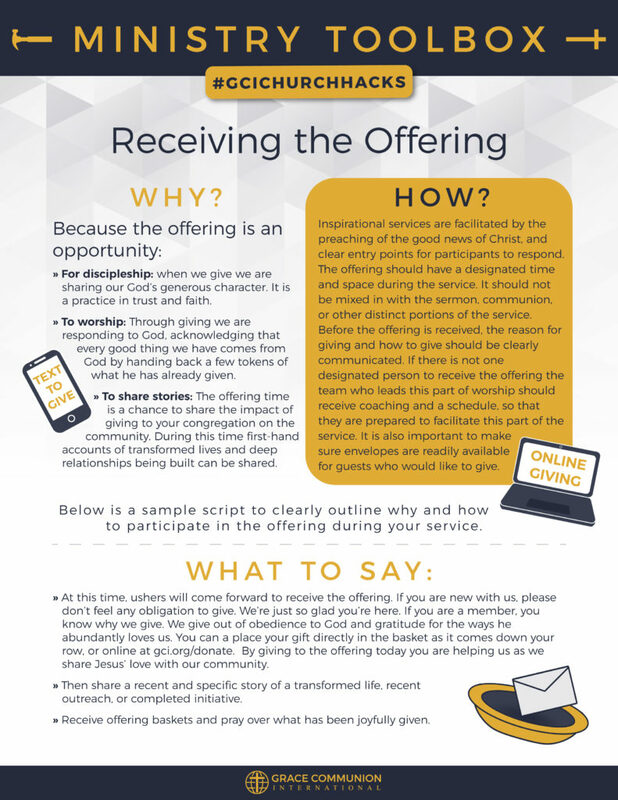 To assist you in this important aspect of inspirational worship services, we’ve prepared the infographic below (click on the image to download). This article is from Santiago Lange, GCI elder in Germany. The basis of stewardship in the Bible is the understanding that God owns all the resources in the universe. In his grace, he allows us to manage some of these resources. We usually think of ourselves as the owners of our homes, our children, our talents, our money, etc. However, it would be more accurate to think of ourselves as “managers” of these things and that is what the idea of stewardship connotes. We are called by God to be stewards of things that belong to God. What are some of the things God calls us to “manage” properly? 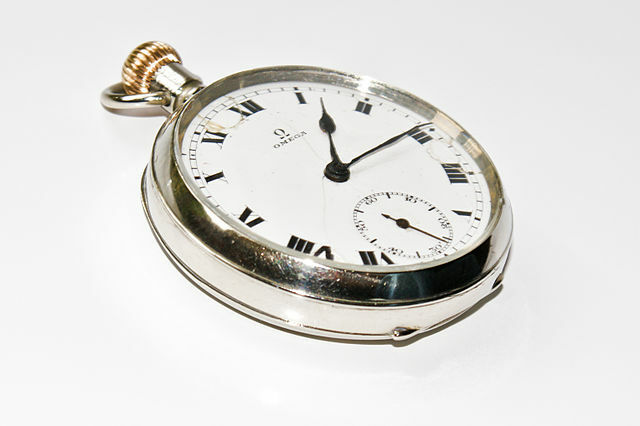 In Ephesians 5:16 (ESV), God calls us to manage our time (and do so with wisdom). We are to make the most out of every opportunity. We live in a fast-paced society where keeping the right priorities is increasingly difficult. There are many things competing for our time these days: work, meals, studies, shopping, TV, sports, reading, the list goes on. It’s possible to allow the many cares of this world to get in the way of spiritual things. It’s not wrong to look after physical pursuits, but a Christian needs to seek first the kingdom of God, to orient their thinking, hopes, dreams and aspirations on the things that are above, thus putting God first in their life. When they do that, all the other things fall into place in proper order of priority. God has called us to be a part of a community of believers. There is no such thing as an “independent Christian.” We need one another! Iron can sharpen iron only when rubbing together. God reveals himself to us in a number of ways. A primary way is through the fellowship of believers. We should eagerly look forward to our time together. Do we give God the appropriate portion in our lives? Or does God just get the leftovers? Being good stewards of the time God has given us means thinking how we can best use our time, not only for ourselves, but to serve Christ and help other people. We know the parable of the talents (Matthew 25:14-30). We all have received gifts from God for the edification of the church and the world around us. Let’s encourage each other to be actively and productively involved in our congregations and communities while doing everything decently and in order. Never underestimate God. No congregation and no person is so small that it cannot be reached and led by the Holy Spirit. We all are stewards of God’s truth. We have been entrusted with the gospel message! Christ is speaking to the world through his church. What an awesome privilege and a great responsibility! This is not the time to slow down or take a break. Christians often refer to “becoming Christ-like.” While it is not wrong to use that expression, we must realize that we will never become exactly like Jesus in this lifetime. Rather than getting involved in a legalistic system of religion that measures success in terms of rules and regulations, we want our lives to be motivated and permeated by God’s love and grace. As faithful stewards of the resources that God has given us to manage, we want to give Jesus Christ our hearts, our minds and our lives. 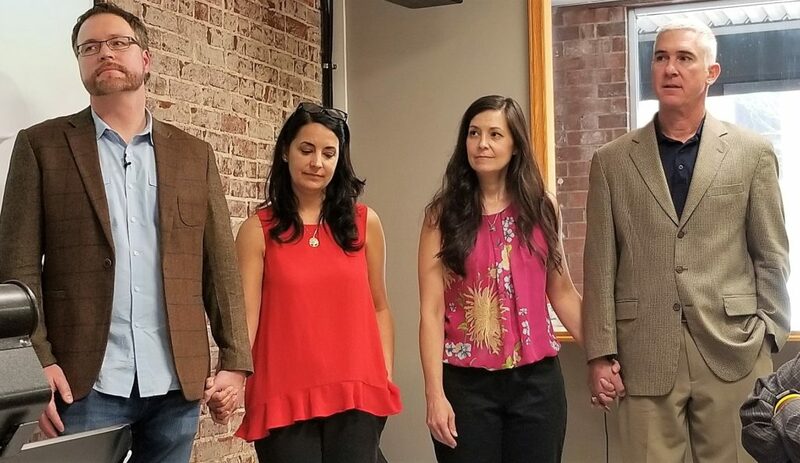 The pastoral leaders of GC Hickory (GCI’s congregation in Hickory, NC) recently sat down with Joe Brannen of GCI Media to discuss their congregation’s relaunch. As you will learn in the recording linked below, though GC Hickory has just begun the relaunch process, they already have experienced both success and challenge in following the Spirit on the road to becoming a healthy expression of church in their target community. For a book about relaunching churches, click here. Note: With this sermon we enter the season of Advent, which spans the four Sundays that precede Christmas day. To read a Surprising God post explaining the meaning of Advent click here. For four Advent-themed videos from GCI, click here. For some music for the season of Advent, click here. Today is the first Sunday of Advent. In my house, that means eating Thanksgiving leftovers while putting up the Christmas tree. Advent, followed by Christmas is my favorite season of the year. Each year we put out a manger scene with shepherds, wise men, Mary and Joseph, and a donkey or two. 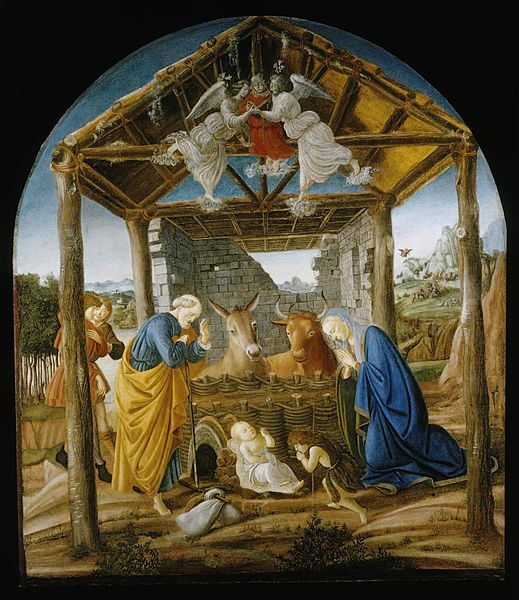 Though inaccurate in many of its details, the scene tells a powerful story, providing a sentiment that gets us thinking about the Incarnation (God becoming flesh). Hope is a powerful emotion, and it’s the theme for today, the first Sunday of Advent. Unfortunately, hope is often trivialized in our culture. We are told: Don’t lose hope! Keep hope alive! H.O.P.E.—Have Only Positive Expectations. We find the word hope emblazoned on cross-stitch samplers and pillows. On a TV show written by an outspoken atheist, the hero declares, “I don’t pray. I hope.” In our culture, hope has become a buzzword—almost a magical word. It’s just one of those things you say: Go get your hope on! We hear it in so many contexts that the word seems to have lost any significance. It’s like white noise in our ears. We are almost tone-deaf to it. But in the book of Jeremiah, including our reading today, hope is profoundly important. It was written at a time when hope was in short supply. Jeremiah himself was involved in many less-than-hopeful situations, including the devastation of Jerusalem by the armies of Babylon, his imprisonment at the command of the king of Judah, and being kidnapped at midnight by a group of rebels. When Jeremiah shares what God says about hope, you can be assured it had great personal meaning for him. Jeremiah sees hope as something essential to survival—his view of hope is tough, enduring and vital. Today we’ll see how Jeremiah views hope in three ways: 1) hope in season, 2) hope in action, and 3) hope within hope. Jeremiah had one of the most brutal careers of all of God’s prophets. Called “the weeping prophet,” he spent most of his career telling the people of Judah (the southern kingdom) that judgment was coming upon them due to their sins, which included idolatry along with mistreatment of the poor, the widows and disabled people. Jeremiah’s preaching made him very unpopular with the people of Judah, particularly its king, Zedekiah, who tried to silence Jeremiah by imprisoning him (Jer. 32:3). Now, instead of running through the city of Jerusalem pointing out everything that was wrong, Jeremiah was limited to preaching by correspondence. It’s ironic that it was during this imprisonment, when Jeremiah likely lamented that he could no longer do the work of God, he was led by God to pen the words of hope we read in chapter 33. Here’s a question: Have you ever felt imprisoned by circumstances? At such trying times has God sent you words of hope? Perhaps it was a passage of Scripture, or a phone call, or a card from a loved one. It may have been a sermon, or the lyrics to a song. Hope is found primarily in Jesus, the Savior of the world. We find great hope knowing that he has come, is coming now by the Spirit, and will come again to set all things right. Because of Jesus, we know that this life is not all that there is. We know that the pain, sorrow, trial and even death we experience on this side of Jesus’ return are temporary. When Jesus returns, he will do what is just and right. The Hebrew word translated stump is netser. It likely refers to a gnarled old grape vine that has been cut down to the roots—just a stump left. The promise is that this gnarled, old, seemingly lifeless stump will send out a new shoot—new growth, new hope. Netser became the name of a town you’re familiar with Netseret–we know it as Nazareth. From out of Nazareth (the old stump) came Jesus—Jesus of Nazareth. He came in the midst of devastation, a time when all hope seemed gone. He came not only bearing a message of hope, but he was, in himself, the Hope of not only Israel, but of all humanity. Jeremiah’s prophecy tells Israel that there is cause for hope. It’s also a message for us—one that should give us hope. We too can trust God to bring us through even the worst seasons in life. No matter how great the difficulties we’re going through, we know they are not the final word. We know this because we know WHO controls the seasons of life. We know WHO brings resurrection—WHO restores life to what seems dead, what seems without hope. Advent reminds us of hope in season. It reassures us that Jesus is coming again as King of kings and Lord of lords. Advent also tells us about hope in action. Before Jeremiah gave his hope-filled messianic prophecy, we learn in Jer. 32:6-15, that God told Jeremiah to buy a parcel of land in Judah at the very time the country was being invaded by the Babylonians. God then told Jeremiah that his land would be stolen, then destroyed. Granted, the land had a rock-bottom price, but who in their right mind buys land in the midst of an invasion? From a human perspective, doing so makes no sense. Yet Jeremiah did what God told him to do. He bought the land, then gave the deed to his servant Baruch for safekeeping. Jeremiah was taking part in a revolutionary act of hope. This was hope in action. 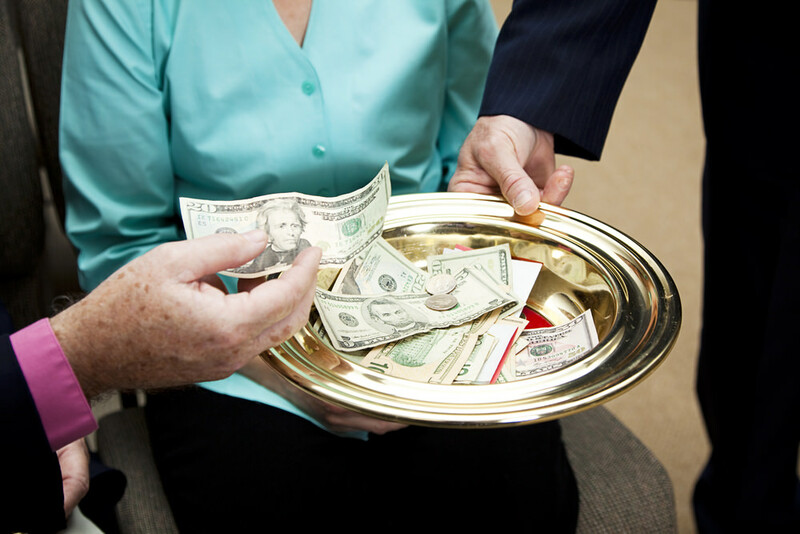 Every week, we choose to give offerings at church. By this act of generosity we declare that our hope is in God, not in wealth. We are saying that God is in charge of our finances. Every day, we choose to love people (including those closest to us). Instead of reacting in anger when they frustrate or disappoint us, we choose to share in God’s love for them, a love based not on what they do, but on who they are—God’s beloved. These are just two examples of hope in action—the hope of Advent. In what ways is God asking you to put hope into action in your life? Perhaps what he is asking you to do makes no sense right now, but can you choose to obey him anyway? Doing so is what keeping your eyes on the kingdom of God is all about. Doing so enabled Joe Tkach Sr., J. Michael Feazell, Joseph Tkach Jr. (and many others) to lead the radical transformation of our denomination out of error and into truth—taking action even though they knew there would be a severe backlash. They did so because they hoped in and thus trusted in God. Thankfully many followed their lead, keeping their eyes fixed on Jesus—on the reality of his life, death, resurrection, ascension and on the promise of his return. That was hope in action. The first “real” concert I attended had 40,000 people in a football stadium to hear the rock group U2. It was the summer of 1992, I was 15 years old. I remember it vividly—from getting our Doc Martins on, to fighting our way to our seats, to jumping over a fence to get back to the car before we were crushed by the crowd. It was amazing. They were one of my favorite bands and continue to be—they still have the old magic. But for a suburban teenager, this was about as close to heaven as I’d ever felt. The concert producers knew what they were doing. There had three opening acts, all leaving us aching to see Bono jump up on stage to do his thing. The stage was rigged with hundreds of TVs; it was quite a display, especially 25 years ago. The last of the opening acts finished and the screen went dark. Then a flicker on one screen. Then on another. A cascade of images and sounds and color. Then dark again. Then all the screens went off at once—then black. Then a news anchor over here, then Martin Luther King over here, then a video of the Hollywood sign. Finally, a bank of over 100 screens flashed to life. Finally one huge image of George W. Bush, who was president at the time, dubbed over to say: “We will rock you. We will rock you.” In front of him the shadow of the great rock and roller—BONO! The lights went up and there’s the whole band and the show begins! And the crowd goes wild! There’s this little flickering in the dark, just a hint. A note played on a guitar, a drumbeat. Then suddenly, there he is. In a way, Advent is like that—it’s a season of anticipation. We light the candles, read the scriptures, sing the songs, all in anticipation of the coming of the Lord Jesus Christ. Advent Season spans the four Sundays prior to Christmas Day. It’s a replay, in miniature, of the grand drama of God and humanity. It’s the “sacred romance” of God and people—his pursuit of us and finally our coming home to him. The righteous Branch mentioned here in Jeremiah did indeed spring up from David. The great, promised King did come. He is the Prophet of prophets and the Priest of priests. Yet he didn’t come like we thought he would—he didn’t destroy, he didn’t end it all, nor did he build heaven on earth. He didn’t vindicate just one nation from just one circumstance in just one time—his mission extended much further and deeper than that. Jesus came as the Savior of all humanity—he came, he comes and will come again to save humanity from its worst ruler—ourselves. He came as a baby born in Bethlehem 2,000 years ago, he comes now through the Spirit, and one day he will come again bodily to earth in tremendous power and mercy. These “comings” (advent) of the eternal Son of God become human—is our hope within hope. We have hope today because we have the ultimate hope for the ultimate tomorrow. Spoiler alert: The good guys win! The parent who mistreated or ignored you does not establish your identity. Because of the advent of Jesus, you are the chosen child of God who God has loved since before the world began. The job you lost did not define you—your identity didn’t disappear when your job did. You are called of God to participate in the spread of his kingdom today and to worship forever in the courts of the King. The lover who never came, or the one who broke your heart, did not define you forever as lonely or rejected. You are the beloved of God, the bride of Christ, pursued forever by the great romantic. The sickness or accident, or the aging that destroyed your body, does not define you. You are the dancer, the beautiful creation of God who will forever walk upright in the Lord’s presence, and by his side. But how does having this identity and the hope it brings change our everyday lives? The answer is that the God who is the Source of our hope is the ultimate and final word on us and our circumstances. Knowing that, trusting in that, changes every moment in our lives today. Praise God, the shoot did come up from Jesse—the branch did come out of Nazareth. Jesus did come, he is coming now, and will come again. Let us live our lives in the light of that truth: Hope in season. Hope in action. Hope within hope. This week's sermon compared the prophecies about Jesus to the introduction of a rock star at a concert, but one that takes centuries to complete. Have you ever been to a concert or performance of a major star? How was this person introduced? Jeremiah saw hope as something vital to survival. Do we see hope that way? He acted within the backdrop of believing that God’s favor would return to Israel (“Houses and fields and vineyards shall again be bought in this land.” Jeremiah 32:15). What does it mean to live our lives with hope as the backdrop, knowing that each season of loss will lead to a season of blessing? Jeremiah lived hope in action, as we see in him buying the field at Anathoth (chapter 32), even though the land was soon to be decimated by Babylon. What hopeful action can we take in our lives as God’s fully-loved people? What actions in our lives show that we are people of hope? How do we balance hope and wisdom? Jesus encouraged us to be “wise as serpents, yet innocent as doves” (Matthew 10:16). He doesn’t want us to be foolhardy, but yet he wants us to live with a supernatural trust—how do we hold these two realities together? This week's sermon showed the prophets as vital to the Advent story, though just out of the picture frame. Are there are other “Advent co-stars” you can think of? What can we learn from them? (e.g. : Simeon and Anna, Elizabeth and Zachariah). Note: This sermon is for the second Sunday of Advent, the season that spans the four Sundays preceding Christmas day. To read a Surprising God post explaining the meaning of Advent click here. For four GCI-produced videos for Advent, click here. Note to preacher: You might begin with a personal anecdote about anticipation-preparation: expecting the birth of your first child, the wedding of an adult child, the birth of a grandchild. When anticipating something good such as a high school graduation, a wedding, the birth of a child or grandchild, a visit with old friends, a much-needed vacation, or retirement, there is joy in the anticipation. But when we’re anticipating something not so good, such as being cut from a sports team, losing someone you love, or corporate downsizing, the anticipation can be filled with dread and agony. In the time covered in today’s reading in Luke, though the people of God had been anticipating the Messiah for a long time, they were not prepared for what actually occurred. None of the Old-Testament prophets (Moses, Samuel, Elijah, Elisha, Isaiah, Jeremiah, Ezekiel, Daniel) had provided the full picture of what was to come. But then came John the son of Zechariah—we know him as John the Baptist. His prophetic ministry was unique in its scope and detail in announcing the Messiah. Today, on this the second Sunday of Advent Season, we will focus on the important ministry of John the Baptist in preparing the way for the Lord Jesus Christ. We will also draw a parallel with how God has invited us to also be participants in preparing the way for our Lord and Savior. The picture we get from the four Sundays of Advent is almost like looking in a mirror and seeing a reverse image: we are presented with a picture of the ministry of the Father, Son, and Spirit flowing in reverse from Jesus Christ’s second coming to his first coming. Though today we will focus on our readings in Luke and Philippians, I encourage you to also read Malachi 3:1-4 this afternoon or later this week. Together, these passages portray the anticipation and participation in ministry that we are given as we await our Lord’s return. According to Luke 1:80, John “grew and became strong in spirit; and he lived in the wilderness until he appeared publicly to Israel.” After spending the early years of his life in a small town in Judea’s hill country, John moved to the deserted area east of Jerusalem. Zechariah and Elizabeth had raised him as instructed, taught him the Hebrew Scriptures, and shared with him the prophetic messages about his future ministry. John grew and became strong in the Spirit. When God called him to start his ministry, he left the desert and began preaching a message of repentance in preparation for the forthcoming ministry of Jesus. John had to leave his familiar, though solitary, home to go where he could work to restore a God-consciousness in the Jewish people of his day. After years of being dominated by foreign empires, the public mindset had become secularized with personal survival being the highest priority. Although the Jews continued to have routine religious activities, the word of God was not guiding their daily living. John called on his Jewish kinsmen to repent—to turn back to God—and he followed up with the rite of baptism (see picture below). The area around the Jordan River was an appropriate setting for those who left their cities and towns to listen as John, a gifted preacher, reminded them of their roots as the people of God. 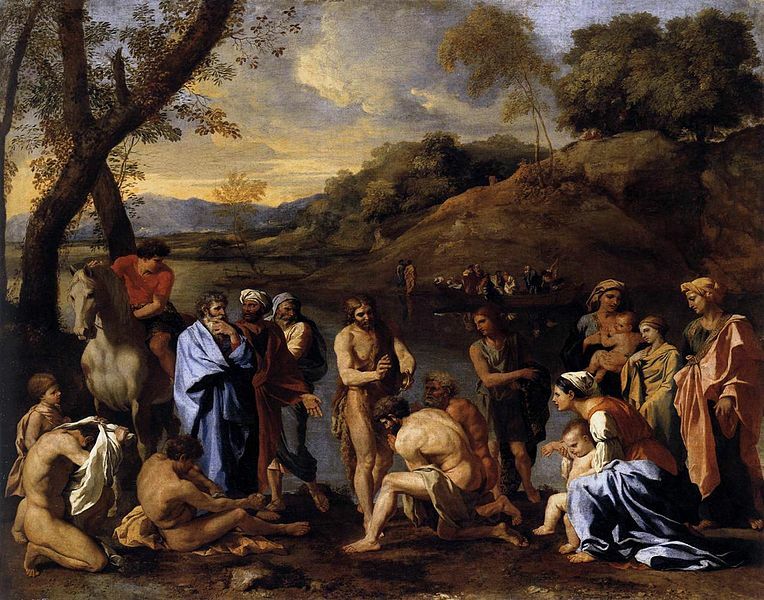 The baptism in water dramatized their cleansing through God’s gracious forgiveness. Isaiah’s poetic words related to John’s calling predicted a prophet powerfully calling on people to change their ways so that they would be responsive to the saving ministry of the Messiah, God’s Son. John was not seeking his own following—he understood that his role was to point the people to Jesus, not to himself. His ministry drew people’s attention to the Messiah who was to appear very soon. One of the highlights of John’s ministry was to participate in Jesus’ baptism—a baptism not necessary for Jesus (who had not sinned), but necessary for all of us. Even today, believers continue to participate in that baptism as a sign of their repentance and faith. As abruptly as John’s ministry at the Jordan began, it ended with his arrest. Herod “locked John up in prison” (Luke 3:20b). He did not enjoy the pleasure of carrying on his ministry into old age. In fact, his ministry lasted for no more than a year or two. Behind prison walls, John could not rejoice in seeing the results of his work of service. John was a special prophet, foretold in Scripture, and honored to prepare for the Messiah. No greater prophetic work was ever done before him, and yet it was cut short of any immediate rewarding celebration. This combination: privileged calling, yet unfulfilled ultimate results, may seem somewhat conflicting. What lessons can we learn from John’s experience? What similarities do we find in the ministry of the church? Luke raises up John as a model for his churches. They, too, prepare for Messiah Jesus and are not the Messiah. They, too, are the pioneers leading others to the frontiers of faith in Jesus. Whenever John’s story is preached as part of the good news, they are challenged to repent, so that they, too, may be prepared for the advent of the Lord Jesus. As modern readers of the Gospels, it’s easy to overlook this connection. The profound truth is that just as John the Baptist participated in Jesus Christ’s ministry, preparing people to receive Jesus, so has the ministry of the church participated for the past 1900+ years—and that includes this congregation today. We were designated before creation and have been called now to participate. We cannot fulfill this ministry inside the walls of our Sunday gathering places any more than John could fulfill his ministry without leaving his familiar home and going to the Jordan River. Our calling is part of an awesome work, and yet, like John, we often serve without the opportunity to enjoy the end results. The apostle Paul considered the members of the church at Philippi his partners in ministry. Their involvement started when Paul first evangelized the city more than 10 years before he wrote this letter from prison. Over the years that transpired, they had actively continued that participation. [It] apparently was first housed in Lydia’s home. In spite of its small beginnings, it grew and became an active Christian community, taking an important part in evangelism, readily sharing its own material possessions, even out of deep poverty, and generously sending one of its own people to assist Paul in his work and to aid him when he was in prison. The members of the church at Philippi were not apostles. Most of them were not even preachers. But, together, they all participated in the ways that they were gifted by the Holy Spirit. They faithfully fulfilled their calling and mission to make disciples, modeling faithfulness in that mission for other churches. Though their part in this high calling was not always pleasurable, it was always powerful and spiritually rewarding. Paul’s letter to them came from a prison cell. Their emissary to Paul, Epaphroditus, in carrying out his appointed task to visit Paul, almost died for the work of Christ (Phil. 2:30). The congregation experienced both joy and sorrow as they joined Jesus in ministry. Many of the churches of that time—just like today—experienced internal problems, which we read about in some of Paul’s letters. Paul referred to himself and Timothy as “servants of Jesus Christ” in the opening words of his letter to the church at Philippi. That is who we are as well—servants who partner with Jesus to fulfill his mission. In other words, the members of the church at Philippi, in partnering with Paul in ministry, were participants in Christ’s ministry. From the city of Philippi, they reached out, sharing the gospel, serving the poor and supporting Paul as they reached far beyond their city limits in the work of Jesus. As we proceed through this Advent Season, going in reverse from the second coming of Jesus toward his first coming, we are wise to consider the stage of Christ’s ministry in which we find ourselves today. Ours is a ministry of participation with Jesus through the Holy Spirit. John the Baptist prepared the Jewish people for Jesus’ ministry. Paul likewise ministered to both Jews and Gentiles, and many of them partnered with him. Today, we follow in the footsteps of these outstanding examples as we participate with Jesus, as he comes to us by the Spirit, in his ongoing ministry to the world. The sermon this week addressed the topic of anticipation. Share a time when you were anticipating something negative. Talk about the emotions. Now share a time when you were anticipating something good. Share those emotions. For years, Israel looked for the Messiah. Explain what you think that meant to them. How are you preparing for the celebration of the Incarnation? Read Malachi 3:1-4 and discuss what these verses mean. What does it mean to be like a refiner’s fire, or a launderer’s soap? Read the poem of Zechariah (Luke 1:68-79). Discuss the poetry. What did people think as they heard it? What did Elizabeth think? How are you participating in Christ’s ministry? Note: This sermon is for the third Sunday of the season of Advent, which spans the four Sundays that precede Christmas day. To read a Surprising God post explaining the meaning of Advent click here. For four GCI-produced videos for Advent, click here. Can you imagine being grateful in a place like prison? Every time the old man was offered the thin gruel that kept him barely alive, he would express gratitude. He had been unjustly imprisoned, beaten, and mistreated, and his spirit survived only by sheer gratitude. I think about this from time to time when I find myself getting perturbed by little things—where is my attitude of gratitude? Today I want to talk with you not just about having an attitude of gratitude but about what we might call aggressive gratitude. That phrase couples the emotion of aggression (fighting, conflict, anger) with the emotion of gratitude (thankfulness, giving and receiving, peace). On the surface, this combination seems like an oxymoron (like vegetarian bacon, jumbo shrimp, or military intelligence). But aggressive gratitude is an appropriate term for us to consider. In our reading from the New Testament epistles today, we continue in the book of Philippians. When Paul sent this letter to the church at Philippi, he was in prison—possibly a form of house arrest, chained to a Roman guard much of the time. 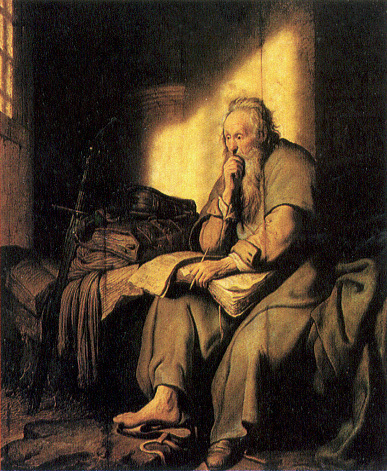 Though he had occasional visitors and was able to write letters (some becoming books of the New Testament), he was still imprisoned. Though the conditions were not the worst he’d ever experienced, he was, nevertheless, anxious, for he was awaiting trial. Most of the time in the ancient world, people weren’t kept in jail for long. Rather than used as punishment, jail was where you awaited punishment, which typically involved torture or execution. Thus, Paul, attached to a soldier much of the time, awaited his forthcoming punishment, not knowing what it would entail. As they say: “The certainty of misery is better than the misery of uncertainty.” Paul writes Philippians in the middle of the misery of uncertainty. Paul’s letter is intended for the community of Christians that met in Philippi—a church he had founded some 10 to 15 years earlier. He is telling them of his longing to return to see them. Different from Paul’s usual letters, he isn’t writing to correct a problem. He’s not rebuking them for false theology or for a particular sin—this is mostly a letter of encouragement and friendship. He is telling them to keep going, to keep walking in faith. They are being ridiculed and persecuted by their neighbors, and there are troubles within the church including divisions and doctrinal fights. Paul exhorts them to be aggressively grateful for the presence of God with them now, and for the life that is theirs in the world to come. I think Philippians is where we find Paul most centered, proclaiming, “To live is Christ, to die is gain,” “Whatever happens to me, conduct yourself in a way worthy of the gospel,” “I count all as loss so that I might know Christ.” Instead of arguing or rebuking, Paul is living in the peace that passes human understanding. Have you ever been in that place? Have you ever been in love, where you were so filled with purpose and strength that everything that used to scare you or anger you just fell away? Paul repeats the word “rejoice” multiple times in this letter. He commends them to do so “in the Lord.” It’s interesting that he uses that phrase. He does not say, rejoice because life is so great. He doesn’t say rejoice because Oprah says it’s good for your cardio health. He says rejoice in the Lord—rejoice because your daily reality is shaped by your heavenly reality. Rejoice for the Lord is near! Paul, facing who knows what punishment, maybe even death, keeps that ultimate reality in focus—he rejoices in realities that can’t be diminished by his immediate physical circumstances. Paul rejoices, despite his circumstances knowing that God is in control, that God will supply all his needs, and even if should he die, life with God awaits him. Anxious. There’s that word. Psychology Today described anxiety as “the modern plague.” There is no shortage of things to make us anxious in today’s world. Yet there is a severe shortage of ways to deal with that anxiety. Paul writes about true freedom from anxiety: “be anxious for nothing,” he says. In saying this he seems to be quoting Jesus, who said, “Do not worry about your life…” (Matt. 6:25). Jesus’s teaching and Paul’s theme in Philippians is that God, who is in control, can be trusted—our true citizenship and home is in heaven and we can count on that, no matter what happens here on earth. Most of us have faced the death of a loved one. When someone is sick, we get anxious, and as their condition worsens, it’s easy for us to get more and more anxious. Sometimes it’s difficult to take Jesus’ and Paul’s words to heart—to not worry, to not be anxious. Paul is telling us that we don’t control the circumstances in our lives. In fact, we don’t really control our lives at all—any one of us can be in an accident, come down with a deadly disease, or develop dementia. But no matter what we face, or what a loved one faces, we are never outside of God’s superintending control. Though we live and die as residents in this world (which is passing away), our true citizenship is with God in heaven. Because of that, we need not be anxious. We are safe and secure in God’s hands. We can be thankful knowing we will see our loved ones again—thankful knowing that eternal life, not death or disease, is our deepest reality. Because the joy of relationship is ours forever, we can practice aggressive gratitude even when the relationship is temporarily interrupted. We can, through the grace given us, celebrate the memories and even rejoice in the pain, knowing it means that we’ve experienced God’s gift of love. The old prisoner in The Count of Monte Cristo survived by being grateful. His gratitude marked his days and nights and gave him power to determine how he was going to feel even in the worst circumstances. In our culture today, we have all sorts of tricks and gimmicks to reduce anxiety or try to make ourselves into better people. But because they all are about believing and looking into self, they have no lasting benefit. We need the stronger medicine offered by Paul, who sees no disconnect between our life with God and our daily life (troubling though it might be). Paul calls us to lift the anxieties of daily life up to God and experience the peace that passes human understanding. That peace can’t be found within ourselves or within this world. As Paul notes, it’s a peace that comes from God—one that guards our heart and mind, for it’s the peace we experience “in Christ Jesus”—it’s his peace, shared with us by the Spirit. Paul is telling us that as we maintain a prayerful posture of aggressive gratitude, our hearts and minds will be guarded. The Greek word Paul used for guarded is one used for a military battalion. It’s as though he is saying that a formidable group of spear-wielding soldiers will guard (maintain) our peace. In writing this, perhaps Paul had in mind the Roman soldier to which he was chained. His point is that God’s peace—Christ’s peace—is our guard. Our Lord surrounds us like a military guard surrounds a castle—ensuring the inhabitants’ safety. With God as our guard, we can have peace within, despite circumstances without. The church at Philippi was facing persecution and other sources of trouble. Their first instinct might have been to panic, to succumb to anxiety by turning inward. Instead Paul urges them to turn their eyes upon Jesus and through his eyes focus on what is noble, right, pure, lovely, admirable and thus praiseworthy. They should not flee the world, but continue in their ministry to the world with a mindset that is tempered by God’s peace. Paul tells us that because the entire world belongs to God, we can enjoy its good things in the way he intends. Knowing that romance, money and work cannot fill the void in us that only Christ fills, we can enjoy these temporary gifts of God all the more. And so Paul tells us to “think about these things”—to see the beauty and goodness around us as the promise that our loving, creative, joy-filled God is the source and ruler of it all. The world we live in today has its trials and tragedies. We live in the time between Jesus’ first and second comings (the “time-between-the-times”), during which, as Paul says, we have dual citizenship. The Christians in Philippi (a Roman colony) were citizens of both the kingdom of Rome and of the kingdom of God. Paul makes it clear that they have responsibilities related to both, though their first allegiance is to the kingdom of God, a citizenship that comes with both responsibilities and privileges. Our citizenship. We are citizens of God’s kingdom here in this world. We know God is in charge. Our minds. We are to set our minds on things above through prayerful, aggressive gratitude. The more we do so, the more we’ll experience God’s peace. And that peace will guard our hearts and minds. Our gentleness. Paul exhorts us to “let your gentleness be evident to all” (Phil. 4:5). The word for gentleness includes the ideas of forbearance and reasonableness—not retaliating when doing so is the natural reaction. This gentleness-under-fire is a true witness to God’s grace and goodness. As followers of Jesus, we seek to display the gentleness, kindness, and freedom of a heart guarded by the peace of God. During Advent we are reminded of Jesus’ “comings” to save us. May these celebrations inspire us to faithfully practice aggressive gratitude. In Philippians 4:7 Paul writes: “And the peace of God, which surpasses all understanding, will guard your hearts and your minds in Christ Jesus.” The word he uses for “guard” is the word for a garrison (large group) of soldiers. Have you ever felt God’s peace “guarding” you? A heavily-guarded peace is another oxymoron that Paul seems to be living out, experiencing peace even while under arrest. Have you ever experienced peace that didn’t match circumstances (one that “passes understanding”)? Paul continues by encouraging us to take our thoughts captive: “Whatever is true, whatever is honorable, whatever is just, whatever is pure, whatever is lovely, whatever is commendable, if there is any excellence, if there is anything worthy of praise, think about these things.” (Phil 4:8). How can we do this in a world flooded with media and entertainment? What are some habits we can cultivate to keep our thoughts captive for God’s glory? Note: This sermon is for the last Sunday of the season of Advent, which spans the four Sundays that precede Christmas day. To read a Surprising God post explaining the meaning of Advent click here. For four GCI-produced videos for Advent, click here. Note to preacher: You may want to share a personal anecdote that answers one of the introductory questions. Have you ever struggled trying to determine God’s will for you life? Have you ever feared that your decisions would lead you out of God’s will? Have you ever struggled trying to figure out how to determine God’s will? Have you ever felt guilty about the decisions that seemed to take you outside God’s will? If you answered yes to any of these questions, you are not alone. It is not uncommon for such feelings of fear and anxiety to arise among those who seek to discover and then do God’s will for them. But we need not be anxious; we need not fear. Let us be instructed by Jesus’ words and example. Here the author of Hebrews takes poetic license in having Jesus speak to us about God’s will. Quoting Psalm 40:6-8, he puts David’s words in Jesus’ mouth, letting us know that the incarnate Son of God has come to do the Father’s will. Through the birth, life, death, resurrection and ascension of Jesus, who took on flesh (incarnation), we see the Father’s will of bringing all his children back to a right relationship with him—a goal accomplished once for all in and through Jesus. Jesus is the superior sacrifice that sanctifies us. It is through Jesus’ sacrifice that God’s will for us is finally accomplished. We have been made holy (sanctified) in Jesus. When Jesus came to do the Father’s will, he becomes God’s will for us. That being the case, when we wonder what God’s will is for our lives, we need look no further than Jesus. He is God’s perfect will for us all. God is not looking for us to perform some perfect physical sacrifice that will earn us a spiritual standing with him. Nor is God looking for some spiritual sacrifice that has nothing to do with our physical existence. Jesus, the incarnate Son of God, is the spiritual sacrifice offered in a physical body. It’s in Jesus that God’s will of being in holy communion with his people has been fully realized—once and for all time. Understanding this reality changes how we approach knowing and doing God’s will. As we come to know Jesus by walking with him, step-by-step, day-in-and-day-out, we come to know God’s will. We live into a deeper relationship with the Father, through the Son, by the Spirit. Coming to know Jesus is coming to know God’s will. Out of this knowing flows our doing. To do God’s will is to participate in what Jesus is doing. Our journey with Jesus is not one in which we are trying to figure out our every next move under a cloud of fear. We rest in knowing him and in following him. Jesus leads us to know him, and his Father through him, and that is doing God’s will. Rejoice always, pray continually, give thanks in all circumstances; for this is God’s will for you in Christ Jesus” (1 Thess. 5:16-18). Notice that, in this case, doing God’s will is not about discerning and then moving into a particular circumstance. Rather it’s about being thankful in whatever circumstance we find ourselves, and then receiving God’s work within that circumstance. God is not sitting back waiting for us to find our way forward. He has sent his Son to bring us forward into our future home in relationship with his Father. Maybe an analogy will be helpful here: Have you ever had to navigate your way while driving in a storm? It’s hard enough seeing the road in front of you and the cars around you, let alone the road signs that need to be read to keep from getting lost. Maybe you were driving and trying to read a map at the same time. While doing so, you feared crashing into an unexpected obstacle in the road. Even with modern-day GPS devices, this would be an anxiety-causing experience: What if we make a wrong turn? Will we ever find our way back? How long will we have to hear the rather obnoxious voice of our GPS saying, “Recalculating! Recalculating!” Does this sound like your experience in trying to find God’s will for your life? If so, there’s little room for rejoicing and thanksgiving. Now imagine you are in the same car, in the same storm, but you are not driving. Jesus is. Your job is to ride in the passenger seat, trust the driver, enjoying the ride, despite the story. He knows the route and knows a thing or two about storms. Even when you don’t see the road ahead clearly, you can relax because you trust the driver—so you keep your eyes on him, enjoying your conversation with him; resting in him, knowing you are right where you are meant to be. Though not perfect, this analogy illustrates the difference between trying to find God’s will for your life and receiving Jesus as God’s will for your life. Hopefully it helps us understand what God has done for us and what he is up to in sending his Son Jesus as the gift of knowing and being in relationship with him and his Father. Why did God give Israel the sacrificial system? Does it seem like a contradiction for God to give the Law of Moses with its sacrifices to Israel, then say that he does not desire sacrifice and offerings? But there is no contradiction—what we are learning is that these sacrifices were not God’s ultimate purpose—not his final goal. They were given as a temporary form of worship until the reality in Jesus Christ was revealed. God took this approach as an act of love, in order to bring his people Israel to a fuller understanding of who he is. God is an accommodating God. He entered the pagan culture of Israel’s time and joined himself to them where they were. Though God did not want a relationship with them built on rules and regulations, he used the sacrificial system to help Israel feel comfortable journeying with him until Jesus would come. Thus, even the sacrificial system was God’s grace to Israel. The people of Israel did not need to approach the altar of sacrifice fearing that their sacrifices were not good enough. God, who provided the sacrifice, told them exactly what to bring and when. The sacrificial system God gave Israel was very detailed. The people were not left guessing what God required of them. Thus, the Israelites could relax and come to know this God as the gracious God that he is. They did not have to anxiously wonder if they were outside God’s will. As they then followed God’s directives, they were gently led in the direction of where the sacrificial system was designed to take them—toward Jesus. However, as we know, they did not follow, though this disobedience was also part of God’s plan to take them to Jesus where they find forgiveness and reconciliation. As we near the end of Advent Season, may we let go of any anxiousness or fearfulness concerning God’s will for us. Yes, we should strive to both understand and do God’s will, but we do so in faith, with hope and love, knowing that Jesus, who is God’s will, is in the driver’s seat and has us, by the Spirit, in his loving, superintending care. We can let go of the steering wheel—it’s in good hands—the hands of God’s perfect, complete and final sacrifice given on our behalf. As we journey with him, we come to know the Father’s will—his grace and peace to us in the person of his incarnate Son. This week's sermon addressed the frustration of trying to figure out and do the will of God. What is a time when you've been frustrated? If God does not desire or take pleasure in sacrifices and offerings, what is it that he does desire and take pleasure in? What so-called “sacrifices” in our day might we confuse with God’s will for our lives? If Jesus is God’s will for us, what does it mean for us to do God’s will? Note: This sermon is for Christmas Eve or Day, which begins the 12 days of the Christmas season (for a Surprising God post about Christmas, click here). A Speaking of Life video and discussion questions are not provided with this sermon. For a Bible Project video exploring Luke's account of Jesus' birth, click here. Here on Christmas Day [or Christmas Eve] our focus turns to the miracle of the incarnation and birth of Jesus. In chapter 2 of his Gospel, Luke gives us a glimpse of the early life of Jesus as a newborn, infant and adolescent. In doing so he intends to help us understand how Jesus shared our humanity at each stage of his development as a human being. Luke wants us to see how Jesus beat back our fallen human nature, overcoming the temptations we face. At every point, Jesus (in his vicarious humanity, by the power of the Spirit) was re-creating our humanity. As God incarnate (sharing our flesh), Jesus not only is with us, but is radically one of us and for us. Joy to the world—the Lord is come! Today, let’s focus on what Luke says concerning the newborn baby Jesus. In our Gospel reading today (Luke 2:1-20), Luke shows how the eternal Son of God came into the world of his creation, becoming human in the most humble and helpless way—born in a stable, then placed in an animal’s feeding trough. Caesar was ruling, but God was in charge—now using Caesar’s edict to move Mary and Joseph 80 miles from their home in Nazareth to Bethlehem. When Rome took a census every 14 years, every Jewish male had to return to the city of their fathers and there record their name, occupation, property and family of origin. When Mary says, “Let it be to me according to Your word” (Luke 1:38, NKJV), little did she know what was in store for her as God went about fulfilling the many prophecies concerning the promised Messiah, including that he would be human, Jewish, of the line of David, and born to a virgin in the village of Bethlehem, David’s town (Gen. 3:15; Gen. 49:10; 2 Sam. 7:1–17; Isa. 7:14; Micah 5:2). Bethlehem, which means “house of bread,” was the ideal birthplace for the Bread of Life. Its rich historic heritage included the death of Rachel and the birth of Benjamin (Gen. 35:16–20), the marriage of Ruth, and the exploits of David. This ordinary scene thus speaks of God’s mighty hand. Mary’s journey to Bethlehem must have been exhausting. Nevertheless, she rejoiced in doing God’s will, and, no doubt, was glad to get away from the gossip-mongers in Nazareth. Think of it—the Creator of the vast cosmos, born as a lowly creature. The eternal Word of God has become a speechless baby! The angels announced this stunning event first to the lowliest of the lows—shepherds. How ironic! Shepherds were outcasts—not even allowed to testify in court. Luke’s point is clear: God cares about the poor and lowly. Moreover, Jesus is the Good Shepherd, and the Lamb of God sacrificed for ALL humanity. Luke is emphasizing that the gospel is good news for everyone. All are included! “Do not be afraid” (Luke 2:10) is a key theme in Luke’s Gospel. Literally the angel says, “I announce to you good news, a great joy which shall be to all the people.” He uses the Greek word that means “preach the good news,” a word Luke uses often in his Gospel and in the book of Acts, which he also wrote. What is this good news? That God has sent a Savior to meet the greatest need of all people—that need here described as peace. The Jewish word shalom (peace) means much more than the absence of war. It means well-being, health, prosperity, security, soundness, and completeness. It has to do more with inner character than outward circumstance. Life was difficult. Taxes and unemployment were high, and morals were slipping lower. Roman law, Greek philosophy, and even the religion of Israel under the Law of Moses could not bring the shalom of God to anyone’s heart. So God sent his Son. And the angels cried out in praise. They had done so at creation (Job 38:7), and now they do so as God commences a stunning re-creation in and through Jesus, the Creator of the cosmos now clothed in our humanity. The purpose of the re-creation is to unite all humankind with God’s “glory.” That glory once dwelt in the tabernacle, then the temple, but it had departed because of Israel’s continuing sin. Now God’s glory has returned in the person of Jesus—God in flesh. Now the “holy of holies” containing God’s presence is a human baby lying in a lowly manger. Glory to God! 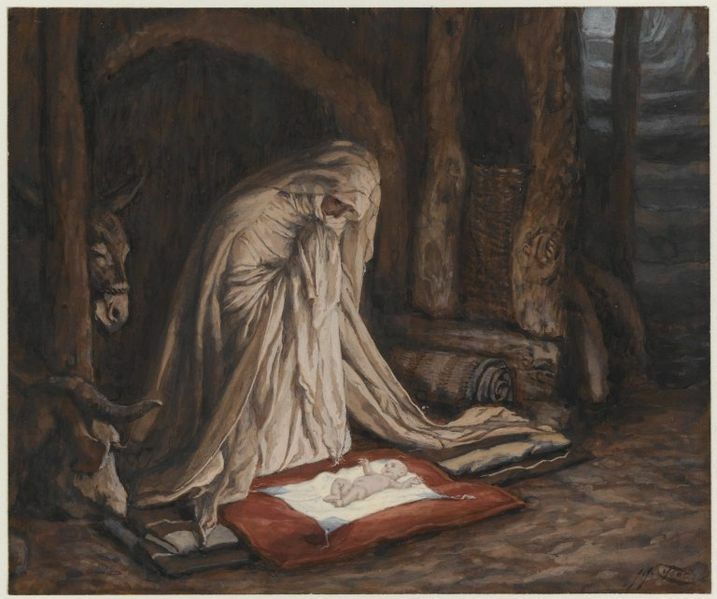 The shepherds knew what to look for: a newborn baby lying in a manger. When they found the baby, they worshiped him and marveled at God’s grace and goodness and the miracle he had done for them. 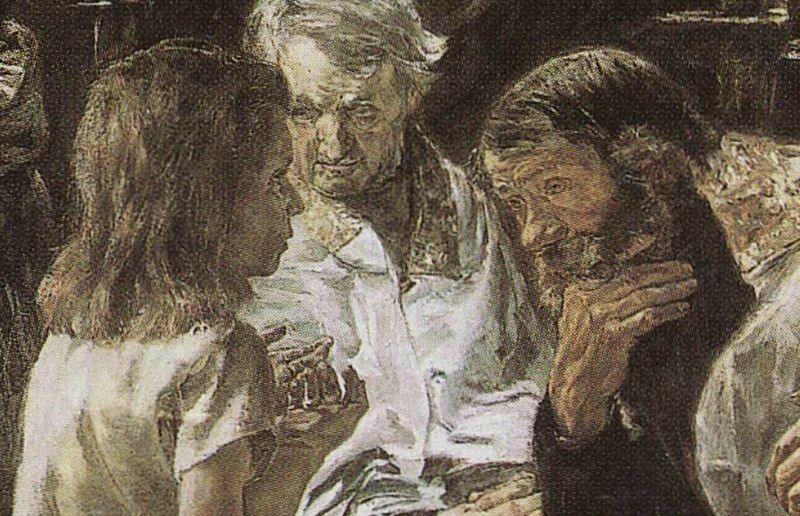 The shepherds, as common people, are models for us today. They received by faith and then responded in obedience to the message God sent. After finding the baby, they shared the good news of what they had encountered with others. In doing so, they glorified and praised God. Then they humbly returned to their duties, new men going back to their life’s vocation. Though they were mere shepherds, God used them to be the first humans to testify to the arrival of the promised Messiah. May we follow their example by living and sharing the good news in our ordinary, everyday lives. Merry Christmas! Christ has come. Note to preacher: You may want to begin this sermon with an anecdote telling about a time you got lost as a child, or a time you thought you lost your child or grandchild. Share your sense of panic and relief. In the midst of the excitement surrounding Jesus’ birth and his escape to Egypt, we have the odd story of Jesus getting lost at the mall—er, the temple. It’s as though there were some more exciting stories of Jesus laying around and this one fell into the wrong file. Given the seemingly unremarkable nature of this story, I’ve titled this sermon “The Most Boring Story in the Gospels.” Boring, of course, until you take a closer look and see it in the context of the whole story as told in the Gospels. The story told in the Gospels, particularly in Luke, is a message about how all people, from every class, tribe and nation, have a moment at the manger. Think of the characters involved, starting with Elizabeth and Zechariah, then Mary and Joseph, then the Bethlehem innkeeper, the lowly shepherds, eventually the rich wise men from the East. The point is that Jesus came for everyone; his advent changes things for everybody. Luke’s story of Jesus at the temple at age 12 is a bit of a palate-cleanser from the Christmas story (which has become rather sugary and familiar). It’s a common story—children wandering off, worried parents in a panic scurrying around to find them. Yet, it’s a unique story in the way it reveals who Jesus is, and what that means for us. Let me offer three points derived from the story: 1) Jesus at the threshold, 2) Jesus gets lost, and 3) Jesus in real life. It was March or April in about AD 8. Given that it was the warm time of year, there would have been fresh flowers and singing birds—all the springtime imagery. By including such details, Luke is showing that Mary and Joseph were faithful Jews. Even more than that, because men were the only ones required to make the trip at Passover, Luke was showing Mary’s devotion in travelling with Joseph and taking along her son. Travelling to Jerusalem from their home in Nazareth would be like travelling from a tiny country village in New Jersey to New York City. Jesus was a star-struck by what he found—Jerusalem. 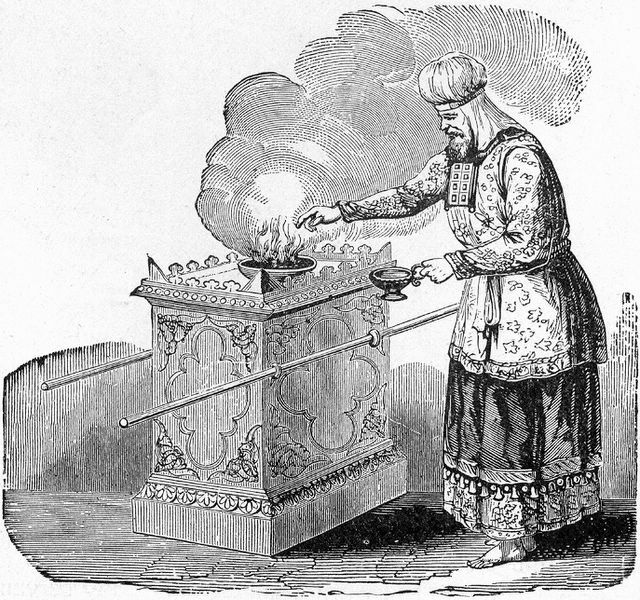 The temple, in particular, was the fountainhead of the identity of faithful Jews. Being in Jerusalem for the Passover Season was something to which all Jews looked forward. As a 12-year-old, Jesus’ instruction in the Jewish faith would become even more intense. His parents would explain to Jesus why they went to the temple each year, and what the great story behind their people was all about. Age 12—the time in that culture of entering adulthood—was a time of learning and increased understanding, a threshold in life recognized pretty much the world over at that time. The body was going through puberty, the mind and emotions started changing drastically. It was on this threshold that Jesus was at the temple when he “should” have been with his parents. After the festival ended and Jesus’ parents began the trek home, unbeknownst to his parents, Jesus stayed behind in Jerusalem. Mistakenly thinking he was somewhere else in the travelling group, Joseph and Mary traveled on for a day. It was a three-day journey back to Nazareth. The caravan in which they travelled would be like a group of minivans caravanning together in our day. It would not be strange for the parents to assume that their son was in another van with cousins. But when they pulled off the freeway to go to a Super Eight Motel, and went to find their teen and take him to the room for the night, the child was nowhere to be found! So they frantically went looking for him among the other relatives and friends in the caravan. When Mary and Joseph did not locate Jesus in the caravan, they hurriedly returned to Jerusalem where, after three days, they found him in the temple. Think of it—three days!! Were we to lose our kids for three minutes, most of us would go into a cold sweat! We’d be looking in every doorway and back alley; the police station, all the hospitals, the arcades and fast-food restaurants. A mother looking for her lost son is a common, yet highly evocative image. In literature, it’s called a “trope”—a certain action or situation that shows up in a lot of stories. This is the trope of human life, and in many ways the life of faith. Sometimes it’s like you can’t find God at all—no matter where you look. You even look in places that used to be familiar. God seemed to be present when I said this prayer or did this quiet time or went to this kind of church service, and then suddenly it seems my spiritual life is dry and dead and confusing. You’re looking in the doorways of those ideas or the back alleys of those old feelings, and you can’t find God. To mix metaphors, your frame doesn’t fit the picture anymore. We can all think of study groups or accountability partnerships that seemed to “work” for us as Christians for a period of time, and then one day they didn’t seem to “work” anymore. We might initially panic, thinking God is lost or even worse, hiding. But the truth is much simpler, as we get older, although we’re thankful for the early study groups and the simple prayers that seemed to connect us with God, we grow in grace and knowledge and we find that godliness is a larger and more complex picture. Though we may have “mastered” the habits of regular Bible study, something inside us is now saying, What’s next? What now? Okay, that part of the journey is complete, and I will walk in what I’ve learned, but there are new places to go, more to see. In such times you may be experiencing God calling you into serving others, participating in what he is doing. God may be calling you into a particular ministry—your part in his kingdom work. It may be that God is calling you into marriage and starting a family. Perhaps God is calling you into new relationships, new ways of being. Maybe he’s calling you into work that will be more fulfilling, even though more demanding. Perhaps you find yourself now in one of those difficult in-between-times when God seems lost to you, when you have lost your bearings a bit. But then you seek after him like a mother looking for a lost child and you find him, and all is well, even if changed. We have to keep in mind that between Luke 2:40 and Luke 2:41, a decade has past—ten years since the visit of the wise men from the East and the blessing given Jesus by Simeon and Anna. Though we know nothing about those years, we assume that Jesus lived the life of a hard-working but well-loved Jewish kid growing up in Nazareth—a tiny blue-collar, back-water village. Maybe the memory of the miracles surrounding his birth were fading. Maybe Mary occasionally thought—”What actually happened?” Or Joseph thought—”Maybe that was all just a weird dream.” It wasn’t only the scribes and Pharisees who were amazed at Jesus’ answers, his parents were as well. There is Jesus, holding his own in the temple—a preteen holding court on the Senate floor, and everyone stops to listen! Jesus’ parents would have been as shocked as anyone. Perhaps the memories came rushing back: the angels, the shepherds, the magi, the manger, the cold night they thought they might never survive. This is real; this is really happening! There comes a moment when the children who have been playing at burglars hush suddenly: was that a real footstep in the hall? There comes a moment when people who have been dabbling in religion (‘Man’s search for God!’) suddenly draw back. Supposing we really found Him? We never meant it to come to that! Worse still, supposing He had found us? I’ve always loved that quote. Here we are just doing church, and suddenly Jesus shows up. Suddenly, it becomes clear again that we are dealing with a person—THE person, not a set of ideas, not a cultural structure, not a philosophical comfort blanket, not a mere concept. These are the moments when we, like Mary and Joseph, walk into the temple to find Jesus doing what he’s always said he would do. His mother said to him, “Son, why have you treated us like this? Your father and I have been anxiously searching for you” (Luke 2:48b). Jesus is at the age here, in that culture, and in most cultures throughout history, where he is proclaiming who he IS. He’s at that age where most of us start to develop an awareness that we are more than just a physical creature, that we have other levels of being. At that age, when Jewish males are given their bar-mitzvah, you start asking questions; you start to wonder. Here Jesus’ personhood is coming out in more dimensions, and for him, his personhood is his God-hood as well. So we have this, the most “boring” and “everyday” of stories in the Gospels, becoming one of the most exciting—the moment that serves as a hinge between Jesus’ miraculous birth and his miraculous life. After the shattering drama of the first two chapters, we come to the very real life of a tween on a family vacation. And that is what it comes down to again. We can have these great church services, these tearful moments and amazing singing, but what does that mean for us on Monday? Or better yet, what does Christmas mean for us in January? Maybe we had that time when we were very grateful, very aware, and spending some quality time with family and with what matters most—do we now go back to life as if nothing has happened? Jesus, the same guy we met in those wonderful Christmas songs and those beautiful memories of Christmas gatherings and the intimacy with loved ones—it’s still here. Jesus is saying to us that things are different, that we are different. If our Christian life isn’t reflected in the way we treat the letter carrier, then we need to check ourselves. If our great spiritual depth isn’t shown in the way we relate to folks in daily life, in the good old friction of work and rest, intensity and boredom, then we should be questioning if we really are so “spiritually deep” after all. This is said once before this—earlier in the chapter after the shepherds visited the manger. It was right in the middle of the drama and excitement of Jesus’ birth with statements made by visitors—both people and angels. Now, in this second instance, it’s in the midst of a very “real life” incident where Jesus gets separated from his parents. Still, Mary treasured all of this in her heart. She treasured the gifts of God, both the dramatic and the mundane. Can we do that? Can we see God and his gifts in our lives beyond Sunday morning? Can we see Jesus in the way we relate to our spouse after a long day or our kids when they drop all the popcorn on the floor? Jesus at the threshold: Jesus declaring that his Father is first and foremost God. Jesus gets lost: There are times when God seems lost to us. This is part of the process, part of the journey. When he reveals himself again, let’s listen, let’s pay attention. Jesus in real life: Let’s not put Jesus away with the Christmas ornaments. He is in the rhythm of every day of the year. The most “boring” story in the Gospels turns out to be one of the most exciting. Jesus is real and he wants you to enjoy the same relationship he has with Abba. Put Father first, listen and pay attention, get in the rhythm of making Jesus the center of your life. This week's sermon tells the universal, relatable story of Jesus “getting lost” as a child. Can you share a personal story of getting lost or losing a child? The funnier the better, of course! Has Jesus ever seemed “lost” to you? Has there ever been a time when you grew spiritually or went through something, then looked around and couldn’t “find” Jesus? How did you find him again? How did he draw you back to himself? The sermon shared a quote from C.S. Lewis’s classic book Miracles: “There comes a moment when people who have been dabbling in religion…suddenly draw back. Supposing we really found Him? We never meant it to come to that! Worse still, supposing He had found us?” Have you had the experience of God making his presence suddenly known to you?---as Lewis puts it, of “a real footstep in the hall”? It can be difficult to go from the emotional warmth and feasting of Christmas back to “real life.” It can seem like Jesus getting “lost.” What lessons from this year's Advent Season and Christmas Day can we take into our “real life” ahead? What has changed for us---how will this year be different from last year? How can we keep the message of the Incarnation (Jesus coming into “real life” with us) in the forefront of our minds?